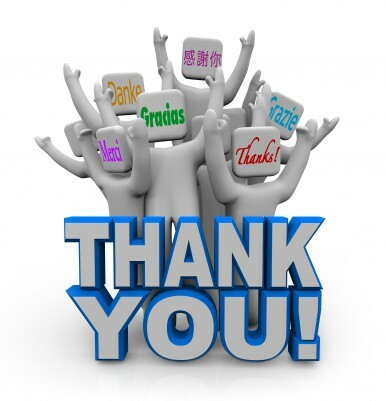 It’s National Thank You Month – Send Out Cards To Say Thanks! No matter how you say it……”Thank You” can never be expressed too much. Do we really need a month devoted to telling us this? All successful business owners know appreciation is the foundation for customer loyalty. I think now, more than ever, people really appreciate receiving a physical greeting card in their mailbox, not inbox. You will certainly stand out amongst your competitors! Why, because hardly anybody does this! In honor of this month, I’m offering 25 Free Thank you cards with every account. It is often the little details that customers recall even more than the product they purchased or the service they received. It’s those little details that make them feel good about not only making the purchase, but making the purchase from you. Here are several ways to go above and beyond good customer service and gain customer loyalty. It’s the little details that keep a customer coming back over and over, it’s the little details that cause a customer to rationalize paying more because she feels she is getting more, it’s the little details that keep people talking about you and recommending everyone they know to you. How would you like to generate more referrals than you ever thought possible? Here’s how. Again, it’s the little things that differentiate one business from another and that influence customers to choose one over the other. Often, small-business owners cut out those details when times get tough, and that’s a big mistake. This is the time to “take it up a notch”. To learn more watch this short video then fill out the short form on this page to get the details for the special promotion I’m offering. Next post: Now Sending Out Cards Means Huge Savings !